My Mother always encourages me to volunteer. "It is good to give back to the community", she says. I try to volunteer at several cycling events every year. I thought since I was lucky enough to chase the Tour for a week in August, I should give a day as a volunteer in my adopted hometown of Denver on the last day of the race as it roars into our state capital for the big finish. I will be contributing to this fabulous event - as a bartender. I have such pride in this random volunteer assignment, if I could only get over the fact that I know nothing about tending bar, nor have I ever been a waitress or worked in a restaurant. This means of course that I will see no racing on the final day, but I will likely hear the music and pour a lot of drinks. I will also understand more fully what it takes to put on these big events. Lesson 1 - apparently it takes alcohol. I attended the volunteer orientation meeting today in Denver. Me and many hundreds of people. We were told that 4,000 local volunteers will be used during the 7 days of the USA Pro Cycling Challenge. Some of the hundreds in the room were cyclists themselves, others were fans, still others knew nothing about cycling. I sat next to a very friendly woman who told me that she volunteers for all the big events, golf tournaments, hockey games, democratic convention. She explained how she always seems to get assigned something she knows about. I turned to her with a grin and said, "I know nothing about bartending," but if you want a generous pour come find me. It costs $200,000 to close a freeway off-ramp. Andy Hampsten holds the record for the fastest climb on the Stage 3 ITT route. Over 650 staff people travel with the Tour to make it happen day after day. The doctor in the medical car will be riding in a convertible. The final set-up in downtown Denver will begin at 4:30 a.m.
100 vehicles and motorcycles comprise the race convoy. 85% of the volunteer jobs are for Course Marshals. 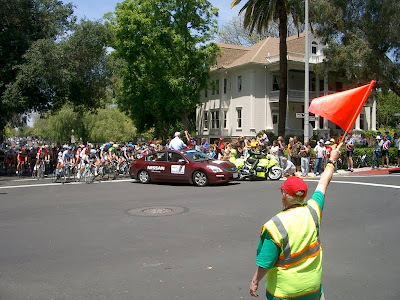 There are actually full-time paid Course Marshals who travel with these Tours as a summer job. You may hear the term caravan used to describe the convoy, but there is no TDF type caravan. Drug testing will be conducted each day on the leader, stage winner, and 2 random cyclists. There are a total of 9 KOM, and 8 Sprint points along the routes. The overall winner of the race will earn just $13,000 of $133,000 total prize money. Compared to the Tour de France which has a total prize purse of €3.5 million, with the yellow jersey earning €450,000. Mr Smith had never before seen such a large group of volunteers in one room in all the 14 races he has coordinated for the Tour of Georgia, California, Utah and now Colorado. Good job Denver!